We had a very enjoyable, relaxing stay at Villa 9. The villa is very well equipped, tastefully decorated, comfortable and very clean. The pool and terrace areas are particularly impressive and have beautiful plants dotted around. We found it very relaxing sitting on the terrace and enjoying the beautiful views in the late afternoon/early evening. The villa is very well equipped, especially for families with small children. We also found it useful that anything previous guests have bought (salt, pepper, spices, washing liquid etc) was available to use. The hosts also provided a welcome basket with some basic supplies which we were grateful for! The villa is situated in a quiet residential area, so felt safe and private. We have visited Playa Blanca before so were aware that it is a short car or taxi journey (4 euros) into the main resort. However the villa is in walking distance (15 mins) of Playa Flamingo which is a gorgeous little beach resort and ideal for families with small children. There are a few shops, bars and restaurants in this area. As advertised, the villa is more suited to families than a group of adults as one of the four bedrooms ajoins the downstairs living area and is not particularly private. However, the villa was ideal for our needs as a family and very spacious and light. The owners responded very quickly to any emails and were really helpful. 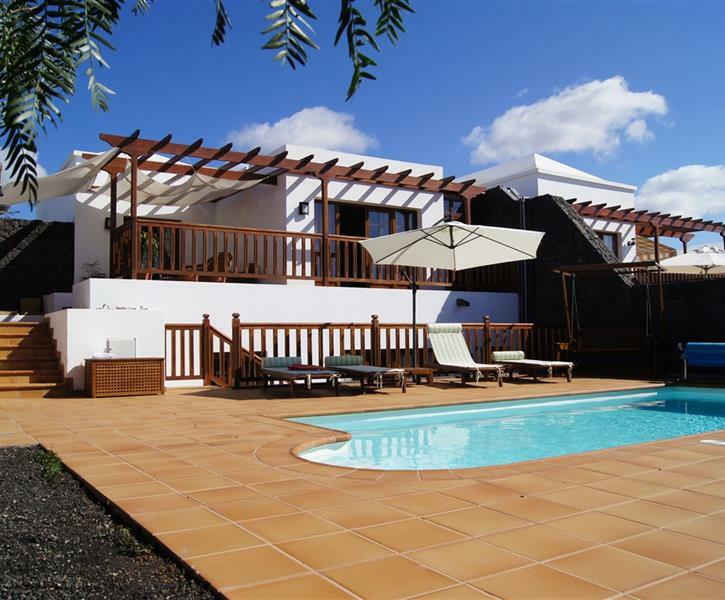 We would recommend this property and would stay here again if we returned to Playa Blanca. Myself, husband and two teenagers (13) recently returned to Ireland from a week's stay at Villa 9 Salamandras. Upon arrival the villa was very clean and had a lovely welcome pack bursting with fruit, bread, milk and wine. Nice touch as we arrived quite late in the evening. The villa is much larger than it appears in the photos and has a gorgeous view over the sea from the patio area. It has a well equipped kitchen and a washing machine in the utility room which came in handy over the week. The garden and outside area is very tidy and well maintained. The heated pool is a great size and there's even inflatables in the garden shed. The villa itself is in a nice quiet location. We hired a car but it's not a necessity as there's a taxi rank within a 5 min walk. There's also a small supermarket within 5 mins walk. Only a 10 min drive to Playa Blanca centre as well as the Marina Rubicon. Overall we had a very relaxing and enjoyable stay. The villa's owners Lourdes and Luis were a pleasure to deal with and were very accommodating on all fronts. I would definitely recommend this villa. Our dealings with the owner Lourdes have been excellent from the first enquiry to the last email once we were returned back home. The villa was well maintained, spotlessly clean, well furnished and very comfortable to stay in for our two week stay. We had a very enjoyable holiday and would certainly recommend to others. The swimming pool and terraced areas were clean and had an excellent view point out to sea. Very relaxing atmosphere and the pool was very well used by our son during our stay. Villa within easy reach of a taxi rank outside the local hotel, with taxis usually in plentiful supply and very cheap to go into Playa Flamingo some evenings. Nice selection of well priced bars and restaurants with friendly and accommodating waiting staff. Been to Playa Blanca several times in the past few years and would gladly return again. Thanks to Lourdes for being flexible with our villa check-out time due to an evening flight home. All in all a memorable holiday in a superb quality villa.